Oeuf! We are back from a month long vaca and it's soooo good to be home. I had a lot of time to daydream about my jewelry and goals. Lately I have been experimenting with different design ideas in my head and I have been thinking of some of the artists who have inspired me. In hindsight, it must have all started at Timothy's Gallery. I LOVED working there! All of their artists were incredibly talented and just plain fun! The owner, Carolyn, had an eye for filling her space with delectable arty treasures. Especially THE JEWELRY. A perk of working there was to model the pieces. I still think of a certain necklace, ring, and bracelet that 13 years later I STILL cannot afford. Ha! So my minds been racing with different thoughts of what I could do with my jewelry and I keep seeing these images. I thought I would post a few pics and share the beauty and creativity these artists have given us. 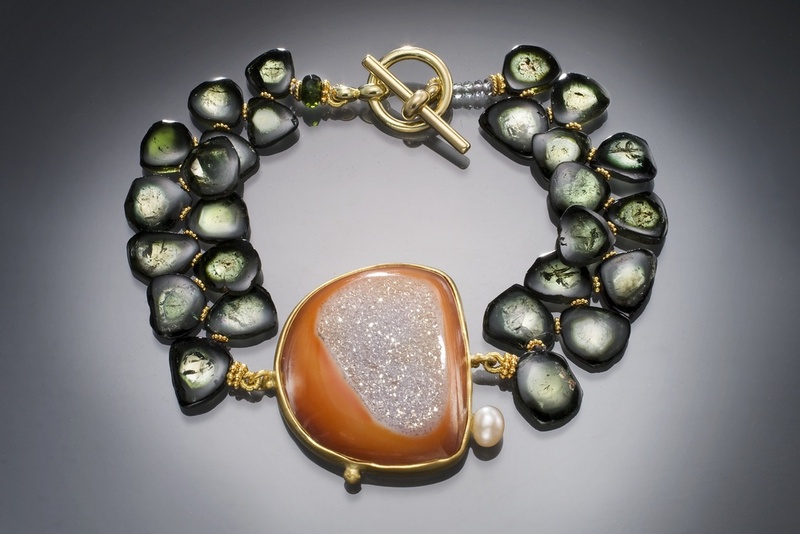 Mary Anne Richman has a perfect balance of organic and mechanical designs. I am in love with the contrast of her materials, their femininity and luster. I can tell you from first hand experience, when you put one of her pieces on they are as comfortable as they are beautiful. These have been on my mind for a long time! Another artist who I think is fantastic in more ways than one is Wendy Brandes. She is beyond creative with her designs. Cheeky and edgy, I imagine her pieces would be quite the conversation starter with friends. Her new barbed wire stacking rings are awesome too! Wendy has been very encouraging to me and just recently told me she collected buttons as a child. That made me smile. :) Thanks Wendy!